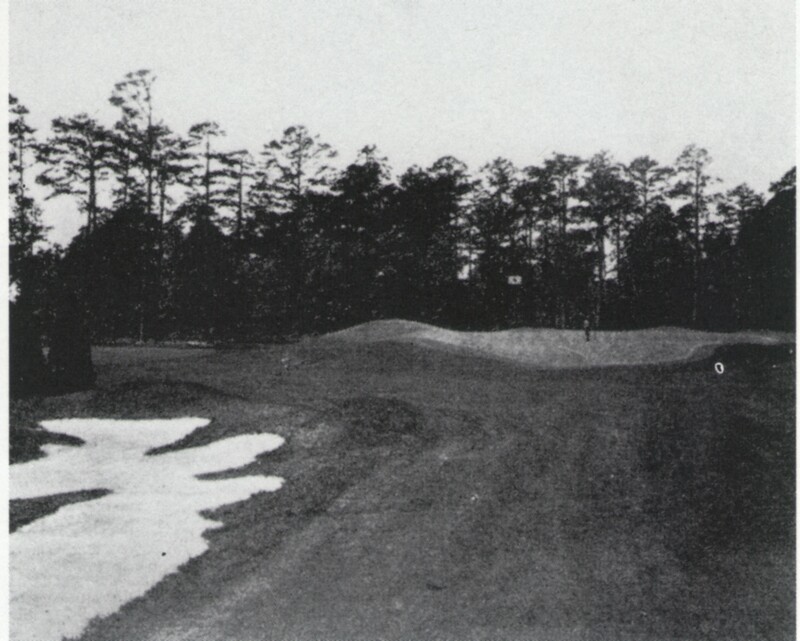 Augusta National's first green in the early 1930s, when it was still the tenth. The bunker was later removed and a different bunker was added, closer to the green. The putting-surface contours haven't changed much, however. In Augusta National’s early years, a small creek ran across the first fairway, at the bottom of the hill, less than a hundred yards from the tee. The carry over the ditch was so short that few players even noticed the hazard, but a member named Clarence J. Schoo—who ran a boxboard manufacturing company in Springfield, Massachusetts, and was a close friend of the club’s chairman and co-founder, Clifford Roberts—drove into it so often that it came to be known as Schooie’s Gulch. After topping yet another drive into the creek one day, Schoo said to Roberts, “I wish you’d fill in that damn ditch.” Roberts did fill in the ditch, during the summer of 1951—and sent the bill to Schoo. That, at any rate, is how the story is usually told. The real reason for eliminating the ditch was that the club wanted to replace its old press tent with a Quonset hut, on a site to the right of the first fairway, and the ditch was in the way of the planned foundation. The ditch also constituted a maintenance headache that Roberts wanted to eliminate. Schoo, who later became a vice president of the club, did gladly pay for part of the alteration, but he almost certainly wasn’t surprised when he opened his bill. This entry was posted in Golf Courses, Masters, Tournaments and tagged Augusta National by David Owen. Bookmark the permalink. this story made my day. thanks! I’m impressed, I must say. Actually rarely do I encounter a blog that’s each educative and entertaining, and let me tell you, you may have hit the nail on the head. Your thought is outstanding; the issue is one thing that not sufficient people are speaking intelligently about. I am very blissful that I stumbled throughout this in my search for something relating to this. No wonder I have never been able to play golf……….my gene pool was damaged. Not much to tell, David. Clarence was my grandfathers older brother and my father was his only male heir and favored as such. Clarence and Grace never had children. Your stories were frequently repeated at family gatherings. He was a very popular member of Augusta, as you might have learned …….in spite of his lack of golfing ability. Thanks for your treatment back in 2012. He may be my favorite Augusta member of all time. I am very, very happy to have heard from you. I am avid collector of items from Cypress Point Club and have the privilege to play there several times a year. CPC is usually ranked No.2 just behind Augusta. I found this website while researching an item related to CPC I purchased a number of years ago which is associated with your great granduncle. It is a CPC Privilege Card issued on August 24, 1956 at the request of President Eisenhower for Mr. and Mrs. Clarence J. Schoo and signed by the Secretary of CPC. I would be glad to send you a picture of the card if you have an interest. Great stories of your great granduncle. Perhaps he was not a very good golfer but I beat he was great to play with. Hey, send me a copy, too! This is the coolest. myusualgame@gmail.com.